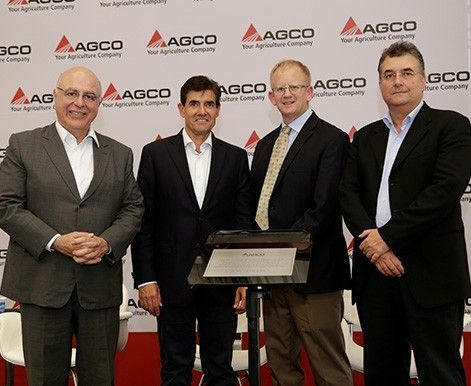 Luís Felli, the new CEO for AGCO South America, Arnaldo Jardim, the Secretary of Agriculture and Supply of São Paulo state, and Duarte Nogueira, Mayor of Ribeirão Preto, attended the ceremony. Ribeirão Preto (SP), January 31st, 2018 - AGCO, a worldwide manufacturer and distributor of agricultural equipment, has officially opened a new line for the production of sprayers with brands Massey Ferguson and Valtra in the city of Ribeirão Preto (SP). The event was attended by the following authorities: Mayor of Ribeirão Preto, Duarte Nogueira, Secretary of Agriculture and Supply, Arnaldo Jardim, and AGCO’s CEO for South America, Luis Felli, who has recently joined AGCO on January 12, in addition to special guests. The Secretary of Agriculture and Supply of São Paulo state, Arnaldo Jardim took the opportunity to highlight the importance of agriculture in the State. "Today's inauguration is an example of trust, enthusiasm and faith in Brazilian agribusiness. In these times of recession, the industry saved the day and the crop. When talking about agriculture 4.0, agriculture in São Paulo and Brazil shows dynamism, quest for productivity, with innovations that dialogue with themes such as connectivity and sustainability", says Jardim. The mayor of Ribeirão Preto, Duarte Nogueira, stressed that AGCO is essential for the community. "It is very good for Ribeirão Preto and for Brazil, when we are overcoming an adverse scenario, to see companies promoting development. The production of this line in the city will help to compose a quality portfolio to serve both the domestic market and the foreign markets”, he concludes. The occasion was the first official event of Luis Felli after the announcement he joined the company as the commander of AGCO South America. With the arrival of the sprayer line in Ribeirão Preto, a portfolio expansion is planned, which will increase the volume delivered by the company to the sprayers market by 40%. AGCO has been making significant investments in the Ribeirão Preto unit since 2015, such as the modernization of the assembly line for sugarcane harvesters to support the growth of the company's domestic market share and also to meet the company's future demands in the foreign market. In total, more than R $ 100 million have been invested over the past three years and today the Ribeirão Preto unit is AGCO's Center for Excellence in Sugarcane Equipment. "We are making unparalleled investments in the Brazilian market. From 2017 to 2019 more than 150 new products will be launched. It is worth mentioning the T line, whose CVT transmission system significantly reduces fuel consumption and emissions, a great benefit for the environment and for farmer competitiveness”, says Felli. "Innovations like this are a great challenge, but this is our commitment to the Brazilian agribusiness and to Brazil. Our agricultural products in general are commodities and any new technology that will improve the Brazilian competitiveness will be very welcome", he concludes. Sprayers are agricultural equipment used in the application of pesticides or fertilizers on growing areas. 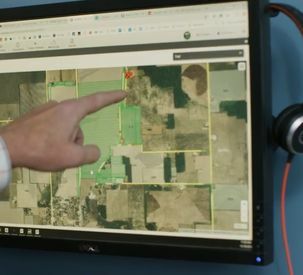 With them farmers can optimize and streamline the application and have precise control over applied product quantities, ensuring increased productivity and production quality. 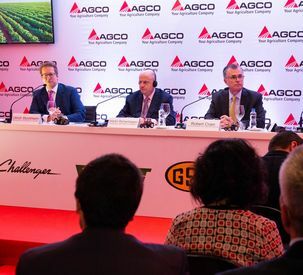 AGCO (NYSE: AGCO) is a global leader in the design, manufacture and distribution of agricultural solutions and supports more productive farming through its full line of equipment and related services. AGCO products are sold through five core brands, Challenger®, Fendt®, GSI®, Massey Ferguson® and Valtra®, supported by Fuse® precision technologies and farm optimization services, and are distributed globally through a combination of over 4,200 independent dealers and distributors in approximately 150 countries. Founded in 1990, AGCO is headquartered in Duluth, GA, USA. In 2017, AGCO had net sales of $8.3 billion. For more information, visit http://www.AGCOcorp.com. For company news, information and events, please follow us on Twitter: @AGCOCorp. 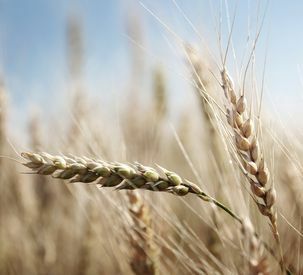 For financial news on Twitter, please follow the hashtag #AGCOIR.